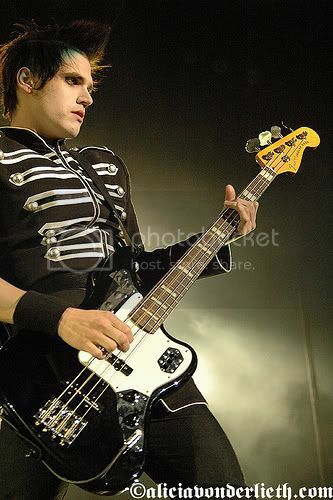 Mikey used this bass sometimes prior to getting his own artist signature . 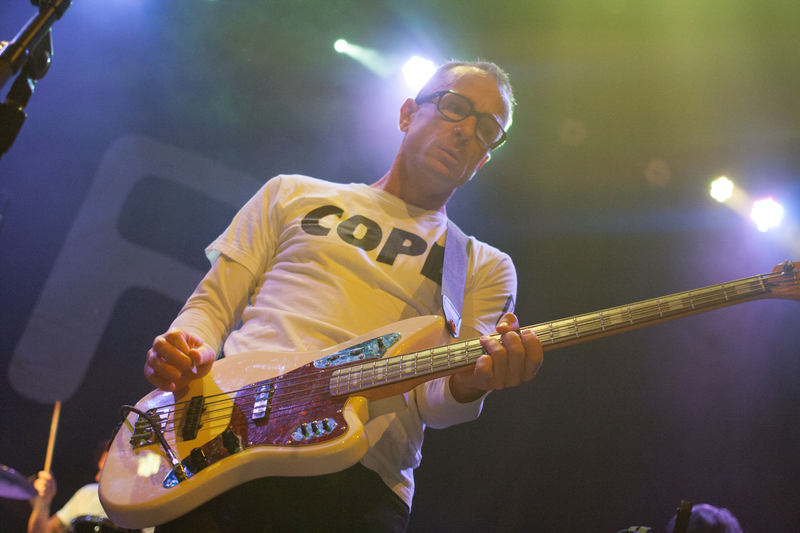 Though he is seen with his signature and the silver p-bass , he has also used this jaguar during "The Black Parade" and "Three Cheers For Sweet Revenge"
In this picture, Matt Sharp is seen using Fender Deluxe Jaguar Bass. 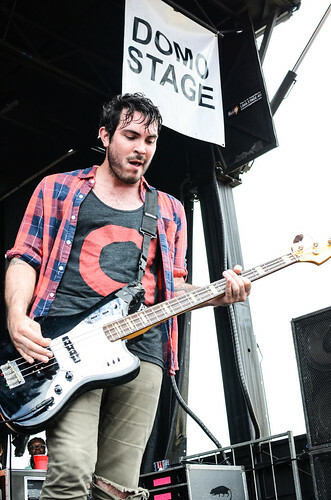 In this photo you can see Sergio with his Jaguar bass. In this image from from Coachella 2011, Rhydian Dafydd of The Joy Formidable can be seen playing the Jaguar. 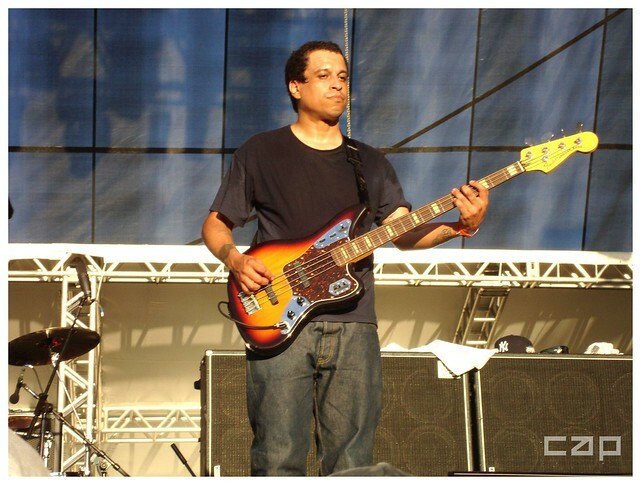 Adamson can be seen with a Fender Deluxe Jaguar Bass in this photo. In this photo, Harvey can be seen playing a Fender Deluxe Jaguar Bass with a black finish. You can see in this video of 'Hook Line and Sinker' at Reading 2015, Mike Kerr is using a Fender Jaguar Bass. This video is of a live performance Ghost performed at the 2011 Hellfest. Between 0:22 and 0:24 the video shows a good close up shot of Water Ghoul's Fender Deluxe Jaguar Bass. The Deluxe Jaguars featured 2 vintage single coil pickups appose to the stand Jazz/Precision configuration the standard Jaguar's have. This model was discontinued and brought back several times since the mid 2000's and with popular bands such as Ghost performing with them, Fender is sure to release a newer model eventually. Ryan can be seen playing a Fender Deluxe Jaguar Bass in sunburst with a white pickguard on multiple occasions, most famously in the music video for "Renegade 86" at the 3:38 minute mark. In the photo, you can clearly see the bassist, Harmony Tividad, holding her red Deluxe Jaguar Bass. Love these basses and also the Jag guitar. The Growl in my rig! The Fender Deluxe Jaguar is all the growl you need. My favourite bass ever! Needs a custom paint job and does hum a little though. Great bass for multiple different styles. With an active pre-amp which you can switch on and off and two jazz pickups this baby is a loud beast. My main bass, I would only say that it requires proper shielding since it can get noisy with lots of hiss.